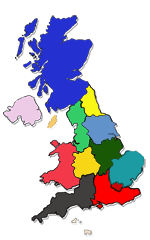 The toes of England hold a remarkable selection of steam and related centres. Some of them reflect the industrial heritage of the area. Others the tourist locations. The Great Western Railway is well represented, particularly with a museum in Plymouth. A collection of miniature railways and the interesting cliff railways offer a good variety of days out for local residents and visitors, families and enthusiasts alike. Make sure not to miss the West Somerset Railway in Minehead - at almost 23 miles, the longest in the UK - and its ten restored stations. The Midland Railways line from Mangotsfield opened in 1869. The plan is to reach Bath once again. The line between Wadebridge Quay, Bodmin and Wenford Bridge in 1834 primarily to carry sand, stone and agricultural produce. Originally opened in 1871, this line has operated between Meldon Quarry and Sampford Courtenay since 1997. This scenic railway from Lydney to Parkend was opened in 1985 and has been gradually reopened to its current 41/4 miles. The East Somerset Railway was founded in 1973 by David Shepherd, the famous wildlife and railway artist, to provide a home for his steam locomotives. This railway was opened in 1908 and now carries passengers on a scenic route through the North Gloucestershire countryside to the beautifully restored station at Winchcombe. Opened in 1887, this is the 83/4 mile brandh line from Gwinear Road to Helston. The Ryde & Newport Railway, opened in 1875, has been run by a preservation group since 1971. This miniature railway operates around the perimeter of a lake and negotiates steep gradients. This railway is preserved as a typical GWR seaside branch line. A miniature diesel-hauled train carries passengers on a tour in the tropical bird garden. Marsh Mills is now home to the Plym Valley Railway and at present the short section from Marsh Mills to Lee Moor Crossing sees steam-hauled trains on selected Sundays. The Somerset & Dorset Railway Heritage Trust has restored the station at Midsomer Norton along with other buildings. Track has been laid southwards from the station towards Masbury. The Buckfastleigh, Totnes and South Devon Railway originally opened in 1872. It was reopened by Lord Beeching in 1969 and in 1991 the South Devon Railway Trust took over the operating of the line. This former London & South Western Railway branch line was opened in 1885. The first trains run by the preservation group started in 1970. The Midland & South Western Juncion Railway was originally formed in 1884. In 1979 a preservation group took over the site and now operate mainly steam-hauled trains along reinstated track. Operated by the South West Main Line Steam Company, the Yeovil Railway Centre was founded in 1993. Originally built for the South Devon Railway in 1885, restoration commenced in 1997. This line runs partly along the trackbed of the old Somerset & Dorset Joint Railway, closed in 1966. This narrow gauge railway commenced operating service in 1990. This narrow gauge railway runs from Eastoke and along Hayling Island seafront. This line runs through extensive grounds of Longleat House as an out and back loop in 1977. The Lynton & Barnstaple narrow gauge railway opened in 1898 and 1 mile of track is operated today. This narrow gauge railway is part of a large family entertainment complex. This miniature railway was inspired by the estate railways constructed by Sir Arthur Heywood in the late 19th century. This miniature railway, opened in 1975, was built to complement the permanent Peco Model Railway Exhibition. Since 1963 this narrow gauge line runs through beautiful gardens and woodland, passing by a lake. This miniature railway hauls passengers to the Animal Encounters Area of Cattle Country Adventure Park. Operated by the North Wilts Model Engineers Society, this popular dual-gauge miniature railway started in 1961 on raised track. Gradually extended over the years, its present layout is one outer circuit with an inner figure-of-eight. The line, opened in 1989, runs within the wildlife park. This miniature railway, opened in 2007, operates a circuit round Hotham Park. This line operates along part of the trackbed of the former GWR Chacewater to Newquay branch opened in 1849. The 15in-gauge line opened in 1974. This miniature railway, operated by the Bournemouth & District Society of Model Engineers, runs on the west side of Littledown Park. This club track was formally opened on its present landscaped site on the outskirts of Plymouth in 1990. This line started life as Southern Miniature Railways in 1949 and was one of a number of similar railways owned by the same company at Stokes Bay, Bognor Regis and Southsea. Developed since 1999, this miniature railway hauls passengers with a fleet of battery-operated scale model diesel outline locos and several steam locos. This funicular railway opened in 1926. It was refurbished between 2005 and 2007. The oldest of Bournemouth&apos;s three funicular cliff railways. This electric funicular railway was opened in 1935. This is a gravity operated funicular railway. The present line was completed in 1980 and miniature replica electric trams take passengers on a trip alongside the estuary of the River Axe and along the valley of the River Coly to the terminus at Colyton. Shillingstone station opened in 1863 on the line formed by the 1862 amalgamation of the Somerset Central and Dorset Central Railways. This electric funicular railway opened in 1908, a few months after the East Cliff Lift. The Great Western Railway Museum is housed in one of the last remaining railway buildings at the end of the Monmouth to Coleford branch line, originally opened in 1883. This the heritage railway station at Washford. The museum in the heart of the former Swindon Railway Works and tells the story of the men and women who built, operated and travelled on the Great Western Railway. As they pass through, visitors meet railway workers, original equipment, famous locomotives and more - all telling the stories of the GWR. This interactive museum, operated by a voluntarily-run Trust possesses one of the largest displays of railway lineside notices in Britain.